How can you check partitions on a hard disk to see if it contains bad sectors or other errors? When there are bad sectors or any error on a disk partition, it usually means that the drive has some damaged sections which are not available for data storage. If you keep saving data to a partition that has errors or bad sectors, you may lose the data stored on the partition. Then, how can you know whether a partition has any error or bad sector? 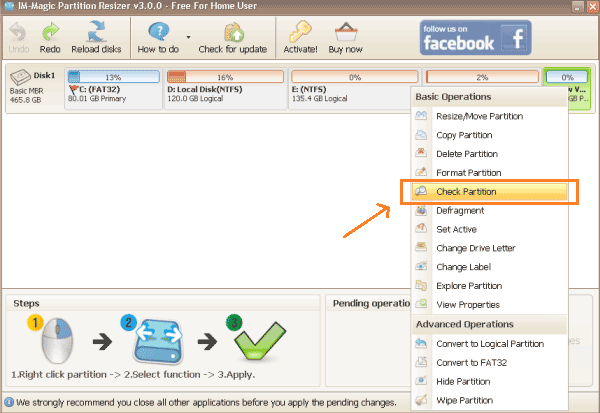 You can use IM-Magic Partition Resizer to check the partition to scan and fix all errors. How to Check Partition Errors? Step1. Right click the partition that you want to check and select "Check Partition" option. Step3. Wait patiently when it is checking partition for error. Then, you can click "Close" button when security descriptor verification completed.